There are only a few instances when I wish I could travel back in time. One is when I’m reading the kid’s menu. One is when I stumble upon Bill and Ted’s Excellent Adventure on TBS. And one is after I’ve launched a new product or campaign. You and I may share that last one. Though we typically know the T’s are crossed and I’s are dotted, it’s the pesky unknowns us marketers wrestle with before a new product launch that keep us up at night. Things like: Is the product’s name right? Is the copy clear, but boring? Clever, but convoluted? Is the value as obvious as it should be? Beyond messaging, most often, it comes down to whether your product’s positioning is right from the start; whether you set the product up in the right conditions and market category in the first place. We all know the market is more saturated than ever. But what if, instead of fighting it, we used that momentum to our advantage? 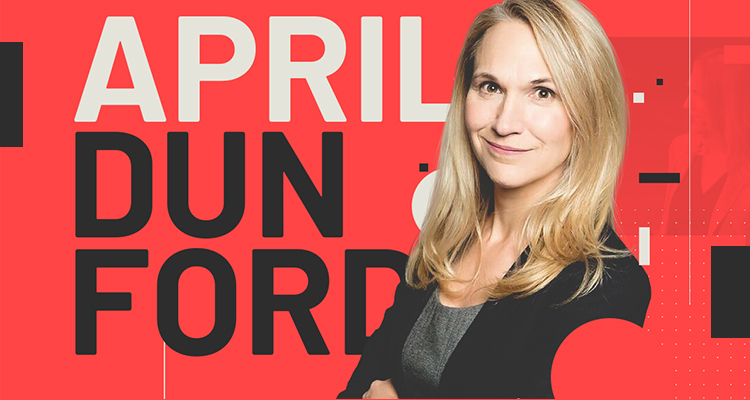 April Dunford is the Founder of Rocket Launch Marketing, the former VP of Marketing for a series of high-growth startups and previous executive at big-wig companies like IBM and Nortel. She’s also a speaker, author and in-demand consultant specializing in product positioning. Advising companies on go-to-market strategy and messaging, she ensures they’re going after the right category and communicating their offering in a way that grabs prospects’ attention and makes its value crystal clear. Check out our Q&A with April below and keep your eyes peeled for the exclusive-to-everyone-who-reads-this-post discount code to see her in person. First thing’s first: What exactly is product positioning and how does it differ from brand positioning? April: You might say “Positioning” has its own positioning problem! It’s such a misunderstood concept. For some folks it’s mainly a messaging exercise, while others associate it very closely with branding. But positioning is much, much broader than either of those things. Product positioning describes the specific market you intend to win and why you are uniquely qualified to win it. It’s the underpinning of your go-to-market strategy and impacts everything from marketing to sales, to customer success and the product itself. What’s the first thing a client asks when you sit down with them? April: Most CEOs don’t know it’s a product positioning problem they have. They know their customers have a hard time understanding what their product is all about and why they should care. That confusion results in long sales cycles, low close rates and poor marketing campaign performance. A lot of the work I do is centered around teaching folks how to create context for their products by focusing on making value obvious to customers. Positioning as a concept isn’t new but, until now, we’ve all been pretty terrible at actually doing the work it requires. I teach companies a process for finding and delivering the best position for their products. What’s the most common mistake you’ve seen businesses make with their go-to-market strategy? April: Hands down, the most common mistake I see is companies trying to market to a set of customers that is much too broad. The reasoning is that, by going after a massive market, it will be easier to claim a small piece of it. In reality, the opposite is true. Broad targeting puts your offering in direct competition with established market leaders that can both out-market and out-sell you. Beyond that, it leads to diluted messaging that waters down your best features and differentiators. The easier—and far more effective thing to do—is target a smaller slice of customers who are highly suited to your product’s key features and the distinct value they can deliver. Once you’ve established yourself with these highly suitable customers, you can build on your strengths and start to expand your targets to larger markets. Can you tell us about the most challenging product positioning case you’ve worked on? April: At IBM, I led the launch of a family of products that demanded an entirely new market category built from scratch. We had to convince customers, experts and analysts that certain market forces existed and would inevitably redraw the lines around existing market categories. On top of that, I had to convince them that IBM was the only company capable of drawing those lines. There was also a catch: The products we had in that family weren’t particularly innovative on their own, at least not at the beginning. So the story itself hinged on convincing people that all of this revolutionary change was going to be sparked by the innovative combination of some pretty ho-hum products. We managed to pull it off through sheer guts, a sprinkling of good luck and the deep marketing talent of my team at the time. But mainly, guts. Your upcoming talk at CTAConf is about how to turn “marketing headwinds into tailwinds.” What do you mean by that? April: In any market category, you’ll encounter extremely powerful forces that can either work for you or against you. We often position our products in markets with strong competitors who are already perceived as leaders. Like swimming upstream, or fighting headwinds, we have to work extra hard to win in that environment. Luckily, most products can be positioned in many different markets that offer greater chances of success. We just have to find ones where that inherent force is pushing us forward, like a tailwind, instead of pushing back on us. In my talk, I’m going to outline exactly how you can use existing market forces to your advantage and grow revenue faster. Want to hear this talk at CTAConf 2018? Get 10% off tickets by using the code “AprilCTAConf2018” at checkout. What should marketers consider, before anything else, when launching a new product? The problem your product solves and the competition it faces. The true value your product delivers for customers. Which types of customers care the most about that value and, most importantly, why? If you’ve got these down, you’ll know exactly who you need to reach, the channels you need to use to reach those people and the value proposition you need to communicate. What should marketers be doing differently now in terms of product positioning vs. five years ago? April: We should start doing it! Most companies don’t deliberately position their product. They assume a default positioning based on how they first thought about it. For example, say you’ve built a new email client. But after you got it into the market, you got some feedback, added or removed features and continued to iterate on it. Now you may have a solution that’s best positioned as a “group chat” or “social network” or “team collaboration tool” instead of focusing on email capabilities. The market frame of reference you choose will completely change the way customers perceive your product and their expectations around pricing, features, support and your competitors. Because the markets are more crowded, more competitive and shifting faster than they ever have before, we can’t get away with ignoring product positioning if we want our products to be successful. 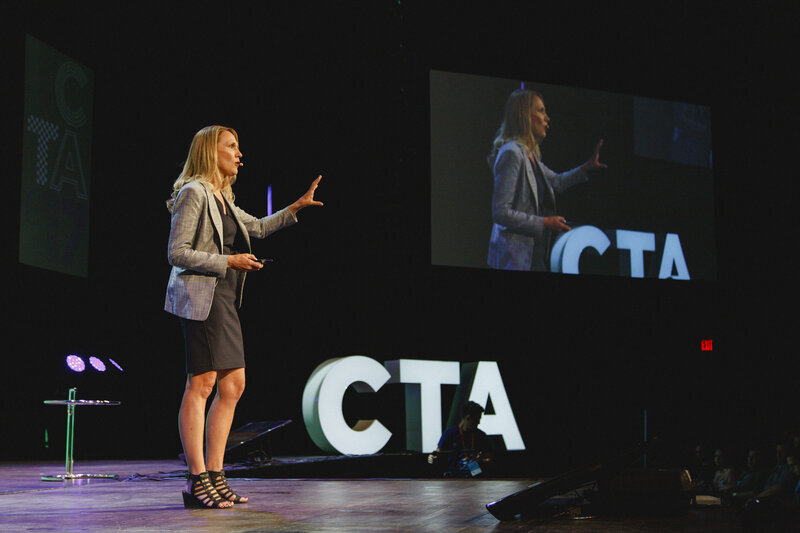 Get every actionable detail of April’s positioning framework and go-to-market guide in her upcoming talk at Call to Action Conference, this August 27-29. Use the code “AprilCTAConf2018” at checkout for 10% off single, group and customer rates! Want more reasons to go? Click here for a bunch of ‘em.